AUBURN, California, April 4, 2016 (ENS) – With US$1,000 or its equivalent in any currency, anyone can place a reservation for a new all-electric Tesla Model 3, priced at $35,000. But latecomers will have to wait in a long line. Showing new strength of demand for electric cars, by this morning more than 278,000 Model 3s had been reserved in just the five days since reservations opened March 31. Even those already signed up will have to be patient though – Model 3 production isn’t scheduled to begin until the second half of 2017. Unveiling the new electric car March 31 at the Tesla design studio in Auburn, Tesla CEO Elon Musk asked and answered his own question. “Why are we doing this? Why are we making electric cars? Why does it matter?” he asked. “It’s very important to accelerate the transition to sustainable transport. It’s really important for the future of the world,” he answered. Musk is concerned about climate change. He pointed to the record high CO2 concentration in the atmosphere: as of March 2016 – 403.5 parts per million – and still climbing. “The last time there was this concentration of CO2 in the atmosphere was 11 million years ago, when primates first started walking upright,” he told the audience, many of them owners of earlier model Teslas. He pointed to the fact that 53,000 people a year die in the United States alone from automobile emissions. Musk is chairman of the board of directors, CEO and product architect of Tesla, a publicly-traded company. He also is the former president of PayPal, founder, CEO and CTO of SpaceX; and chairman of the board of the publicly traded SolarCity, which designs, finances, and installs solar power systems. Musk says he’s dedicated to safety. Model 3 is designed to attain the highest safety ratings in every category. Tesla’s most affordable car yet, the starting price of the Model 3 is just US$35,000 before incentives. The Model 3 achieves 215 miles of range per charge. 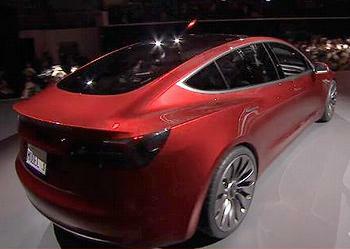 It can hit zero to 60 mph in under six seconds, and Musk said that these are minimum numbers that he hopes to exceed. He says there are already versions of the model 3 that go much faster. There is comfortable seating for five adults comfortably with plenty of leg room. The roof area is one continuous pane of glass, offering headroom and the feeling of openness. With front and rear storage trunks, Musk says the Model 3 has more cargo capacity than any gasoline car and a 7-foot long surfboard can fit inside. All model 3s come with supercharging as a standard feature. Superchargers are free connectors that charge existing Tesla’s like the Model S in minutes instead of hours. Musk says the superchargers allow freedom of travel. 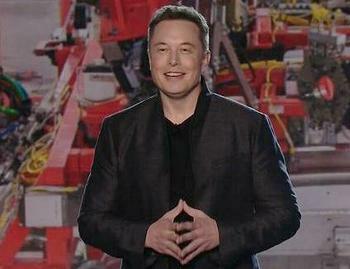 Today Tesla has 215 locations in North America, Asia and Europe; Musk aims double that number next year. Tesla is building a “giga-factory” in California to manufacture lithium-ion batteries in the numbers that will be needed to power the hundreds of thousands of Model 3s that will soon be on the road. The cars will be built at the Tesla factory in Fremont, California, which in the past has made nearly 500,000 cars per year, says Musk. He is confident that Tesla can keep up with demand. Deliveries are scheduled to start at the end of next year, first on the West Coast of North America, then moving east. 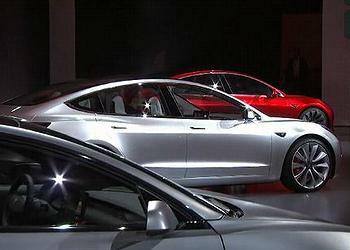 As production ramps up, Tesla plans to begin deliveries in Europe, Asia Pacific and the right-hand drive markets. The company says it’s not possible to ship to all regions simultaneously because regulators in each part of the world have slightly different production requirements. In the interest of fairness, Tesla has set up a different queue for each region. And as a thank you to current Tesla owners, they will get priority in each region.